Bears Trapped !! – Breakout Confirmed – Sensex headed to 20.5k in Medium term. As mentioned in yesterdays post that breakout was seen and the follow up move clearly suggests a clean breakout with a target price of 20500 over the next 3-9 months. In my recent posts after the presentation was we would review the situation as and when 17800/17200 reaches or 18700 is crossed. 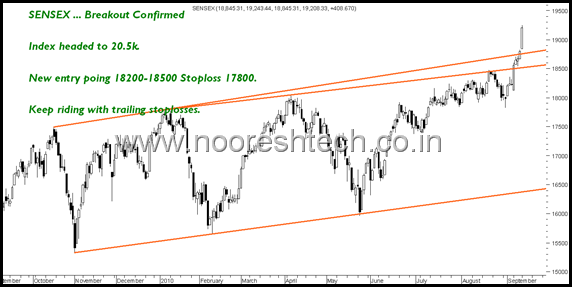 Sensex made a low of 17820 and turned around and has now crossed 18700. As mentioned in my previous posts that we had covered at 5430. Luckily we did so 🙂 following simple technical rules. For now the view is simple Sensex is headed to 20500 zone over the next 3-9 months can be quicker also. The breakout zone was roughly 18200-18500 levels. So any dips to those zone of 18200-18500 would be a buying opportunity with a stoploss of 17800. With the hectic schedule and focus on Client Trades and Money management its become difficult to update the index view everyday in depth 🙂 But for more guidance one can always join our Advisory Services ( Click on Services). We were a bit leveraged in last 5-10 sessions in momentum 🙂 from today advised clients to reduce leverage and keep booking partial profits and use trailing stoplosses to ride the trend. 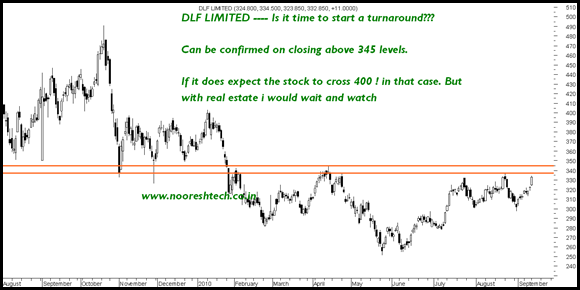 DLF : A sustained closing above 345 would get this real estate stock back in favor. Rishi Laser - Nice cup and handle seen on weekly charts. Interesting buy on dips to 70 for long term investors. JSW energy can see a strong move to 150 in short term. Buy with a stop of 130. Many of our Small Cap Coverage stocks have hit new highs 🙂 for the year. Two stocks under study and expect a detailed report soon - Dhunseri Tea and one more which will disclose later. Whats your view on Ispat industries? What could be the next target and stoploss? I have read lots of website and blogs. every one are interested for PAID clients. .but yours are different. 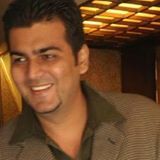 you are also give an importance to small investor who are till not capable to be a paid clients, Like ME. but in future if they will be, I am sure, only think about your services. thanks. what a superb Chart Reading. I am visiting your site since last ONE month. and till no loss. actually i am surprised……….~~!! not now but in future, i will be the paid member for delivery call..!! What do you think of Punj Loyd and Suzlon. There are in the dumps when market reaching new 52week highs daily. Do you think its a good contrarian buy at this time? Also what about JPASSOC, Unitech?. It seems only a big few are moving the markets. Most of the midcaps are infact going down…Any inputs on when do you think the midcaps will start moving up?